The Rev. Dcn. Edward H. Miller has served St. Bartholomew’s as a permanent Deacon since being ordained here by Archbishop Robert Sherwood Morse on July 4, 2004. 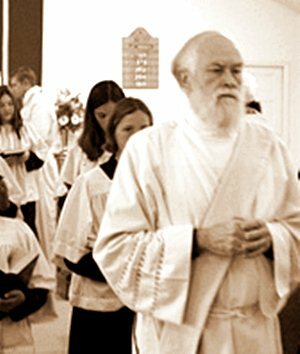 Licensed to preach in the Diocese of the Western States, he served as Vicar of St. Bartholomew’s from April through September of 2005 and presided over the parish during the interim period that led to the installation of Father Davis during the Fall of 2009. Deacon Ed has functioned liturgically over the years, assisting on Sundays and major feasts of the Christian year as well as providing backup pastoral care. Graduate and Post-Graduate studies at The Florida State University, Air Force Institute of Technology, George Washington University, the Industrial College of the Armed Forces, and The Atlanta Law School. Level I, Clinical Pastoral Education, Department of Veterans Affairs – Puget Sound Healthcare System. Research & Development and Combat Support operations, United States Air Force. International Sales and Operations, The Boeing Company. Adjunct Professor: Seattle International University, Central Washington University, City University, Bellevue Community College. Intern, Clinical Pastoral Education, VA Medical Center. Numerous scientific papers and publications in the fields of Re-entry Physics, Nuclear Power Applications, Missile Range Technology, and Military Application of doctrines, policies, and strategies which promote national security. Two publications in law: Foreign Criminal Jurisdiction over Dependents and Civilian Employees, Department of the Air Force, Air University (1969) and Exercise of Police Power on a Federal Enclave, The Atlanta Law School (1980). Married to Joan Williams, DPM. Six children; ten grandchildren. There is never an inopportune time to meet with the Lord. “Call unto me, and I will answer thee, and shew thee great and mighty things, which thou knowest not” (Jer. 33:3). Why? “For I know the thoughts that I think toward you, saith the Lord, thoughts of peace, and not of evil, to give you an expected end. Then shall ye call upon me, and ye shall go and pray unto me, and I will harken unto you. And ye shall seek me, and find me, when ye shall search for me with all your heart” (Jer. 29:11-13). Indeed, God does love us and has a plan for our lives. He will redeem us and restore us to Himself.